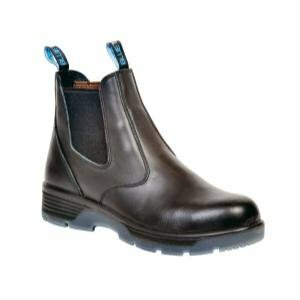 Here’s a classic 6’’ slip on designed boot with variable functionality to fit all job needs. This boot features a 100% full grain leather upper and a leather lined inside for full comfort. A lightweight non temperature transferring Composite Safety Toe cap provides safe footwear with every step you take. Oil/ Acid/ Slip resistant TPU sole assure footing on any terrain. Springback poly-urethane midsole and EVA removable insole combine to provide maximum comfort. An electrical hazard rating and LENZI puncture resistant footbed keep you safe and comfortable day in and day out. If you have any questions about this product by Blue Tongue, contact us by completing and submitting the form below. If you are looking for a specif part number, please include it with your message.